A green lawn is one of the most important features in a landscape design—and installing one is the first step towards having the beautiful landscape of your dreams. At O’Grady’s Landscape, we take pride in each lawn we install and can help you with all types of projects to improve the look and feel of your outdoor space. Need a lawn replacement? No problem! Need a brand new lawn? We’ve got you covered! Serving homeowners in Great Falls, the City of Falls Church, McLean, North Arlington, and Vienna, O’Grady’s Landscape is the company to call for lawn installation and much more. We can even continue providing maintenance services to keep your grasses healthy and beautiful long after the new grass is first installed. So what are you waiting for? Call us at 703-533-5001 to schedule a consultation today! Whether you’re looking for a quick solution for a new green lawn with sod installation or a more affordable method of installation like lawn seeding, we’ve got all your needs covered and more. We can also provide you with rich fertilizers, mulch, and other services to ensure your lawn’s continued growth and lasting health. Unsure what type of lawn installation you need? Our landscapers have experience creating beautiful new lawns for different types of properties and can recommend the best solution for you depending on an assessment of your outdoor space, your requirements for grasses, and your budget. Are you ready to bring your lawn to life with beautiful new grasses? Whether you need to restore a damaged lawn or install a completely new one, we can help you enhance the look of your outdoor space with our premium lawn installation services. And once we’re done, we can proceed to install the hardscapes you love so you can make the most of all your property has to offer! Serving homeowners in Great Falls, the City of Falls Church, McLean, North Arlington, and Vienna, O’Grady’s Landscape is the company to call for lawn installation and much more. We can even continue providing maintenance services to keep your grasses healthy and beautiful long after they’re first installed. So what are you waiting for? Call us at 703-533-5001 to schedule a consultation today! 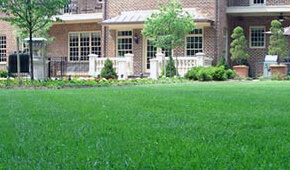 O’Grady’s Landscape is a full-service landscape company in Northern Virginia. Established in 1991, we provide a range of design, build, and maintenance services to homeowners in the City of Falls Church, North Arlington, Vienna, Great Falls, and McLean. By offering a wide variety of services, excellent project management, and timely customer support, we serve as a one-stop-shop for all of your landscaping needs.